Today as with every day we slept in until 0930. We quickly got organised and went downstairs for breakfast. The same boring breakfast. Looking forward to my Sultana Bran again when I get home. 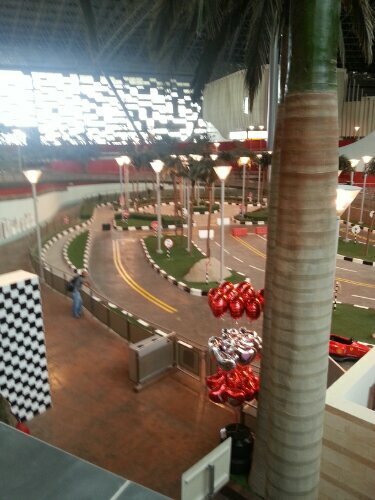 After breakfast we came back to the room and collected our stuff for Ferrari World. We waited down stairs for our driver to pick us up. The driver arrived on time and we got into the van. 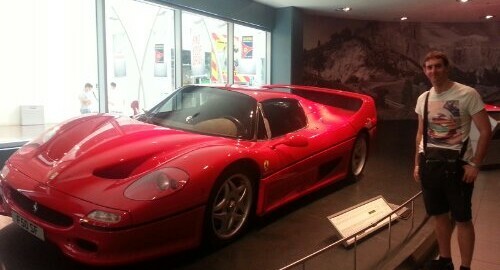 The drive to Ferrari World was about an hours drive. I passed the time publishing blog posts and looking up a new camera online. Didn’t get far. 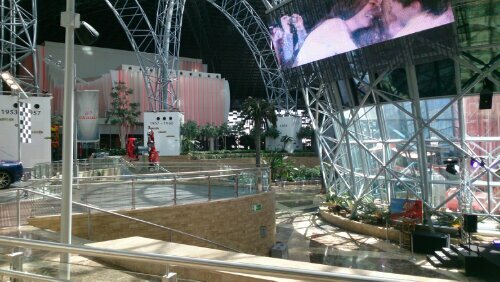 We arrived at Ferrari World at 12pm. We agreed to meet the driver again at the entrance at 5pm. That gave us five hours to explore. I figured this would be long enough. We entered the gates and started exploring. The first ride we went on was the slow kiddies roller coaster. It only goes up to 96kph. It is actually two roller coasters that race each other around. Rhian spent the entire two minutes of the ride with her eyes shut telling me she hates me. So not really any different to any other day of the trip. There are a number of rides which you basically sit in a car that travells along a track. 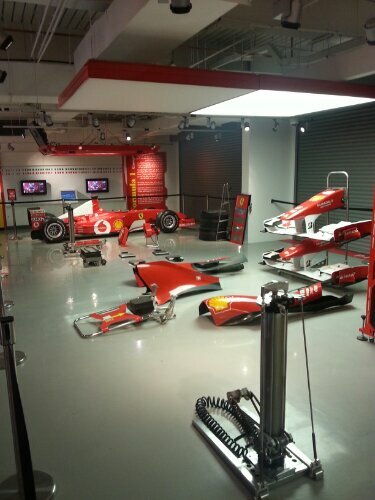 It takes you through different rooms and projected on screens are short videos of Ferrari history and Formula 1 winnings. We went on a large number of these. Both Rhian and I did the Scuderua Challenge. This is your normal Xbox video game but you drive a Ferrari against eight other people and your in a small simulator. The simulator is on a small platform the moves around. The game lasts for maybe five minutes. One of the activities was an interactive game show. The gist is that you have fours rounds. Each round you watch a short video then answer a multiple choice question about the video. You have three coloured buttons on your seats arm rest. Each button relates to one of the question answers. After each round the person who answers the question correctly the fastest gets to go down on the stage to compete in a play off. The whole thing seemed to be a bit rigged as one of the winners appeared to be a seat that had no one in it. 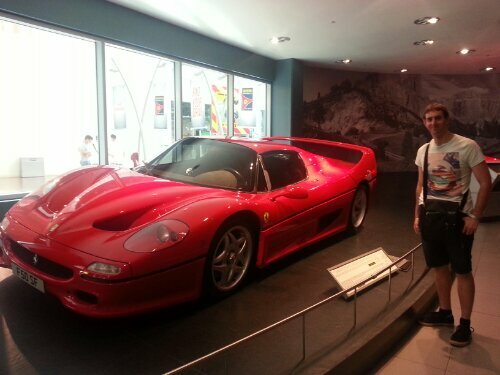 5pm came around and Rhian bought one of the photos of me in the simulator and I bought a Ferrari World magnet. We meet our driver and were driven back to our hotel. Once arriving back at the hotel we tried to call home and wish dad a happy birthday but skype didn’t want to play. We gave up on Skype and sent an SMS. We didn’t eat all day at Ferrari World and I was hungry. We walked across the road to the massive mall and had dinner in the food court. I got indian and it was yum. Rhian got burger and chips. The chocolate shake was good though. After dinner we walked around the store and I bought some new shorts. We checked out the Virgin Megastore but it wasn’t very mega. It was expensive and had nothing different to anywhere else. We then checked out Ski Dubai which is the snow field in the store. Our plan is to visit it tomorrow. It was getting late now so we came back to the hotel to go to bed. Neither of us could sleep and we watched some weird nonsense movie called Children Of The Corn. All I could make of it was the children are some cult that just killed all adults they came into contact with. After the movie we watched a comedy act we had on the tablet. By now it was 0130 and figured we should try and sleep. Day two in Dubai done.